It’s not just whitening- it’s therapy for your teeth that repairs weakened enamel. 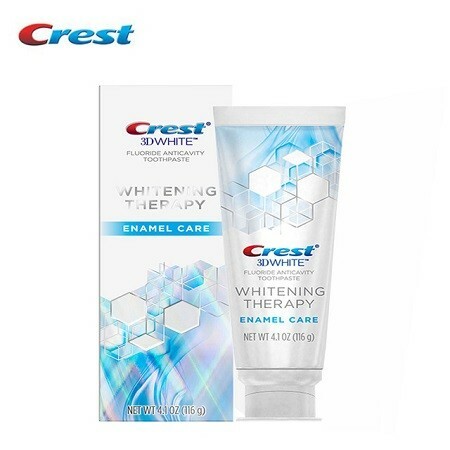 Crest 3D White Whitening Therapy Enamel Care nourishes teeth to reveal a brighter and stronger smile. With our best whitening technology*, this foaming paste uses ingredients that surround your teeth to lift surface stains and impurities, leaving you with a brilliantly white smile. While the toothpaste whitens**, our formula wraps around each tooth, remineralising to rebuild and fortify your weakened enamel. With our new Enamel Care toothpaste, you can face every day with a strong, white smile. Go beyond whitening and give your smile the therapy treatment with Crest 3D White Whitening Therapy toothpaste. The gentle enamel-safe formula whitens and brightens while protecting your teeth as you brush. The gentle formula surrounds each tooth to lift impurities for a fresher, cleaner and whiter* smile. Whitening Therapy Enamel Care toothpaste is formulated to repair weakened enamel and strengthen your smile. The formula contains an Active Mineral Complex and remineralises your teeth to nourish and fortify your smile.